Quick recap: I’m Sasha. I have an extremely healthy addiction to books, Marlon Brando and red lipstick of the bright variety. And now that you know my life story [insert Oprah worthy applause and sympathetic laughter here], I want to welcome you to The Stranger than Usual Section . I will be spamming this part of the blog with my reviews specifically on the fantasy/supernatural/paranormal based genres that I’ve come across. Meaning the played out vamp scene that everyone loves to hate, the werewolves that remind you nothing of puppies and the magic you wish you had. (witches, fairies, etc..) So prepare yourselves because I always judge a book by its cover. Summary: Mara Dyer believes life can’t get any stranger than waking up in a hospital with no memory of how she got there. It can. She believes there must be more to the accident she can’t remember that killed her friends and left her strangely unharmed. There is. She doesn’t believe that after everything she’s been through, she can fall in love. She’s wrong. My first victim would have to be The Unbecoming of Mara Dyer written by Michelle Hodkin. The title alone pinched me with curiosity, but the face of this book is what caught my attention right away (I warned you). With its darkened hues of greys and opaques, a girl floats under water with arms and legs wrapped around her tightly from behind. The book radiated mystery while the romantic in me was hoping for a little side dish of hearts in the eyes kind of lovin’. After skimming the synopsis and reading the first couple of pages, it didn’t take me long to whip out my library card. As much as I adored the cover, I’m almost as much in love with the actual story. Where some parts of this book were fresh to the point of intrigue, it had a habit of teetering on the dangerously typical. The mystery begins when Mara wakes up in a hospital bed with no recollection of how she got there. It becomes known that she was the only one to survive death when the rest of her friends did not. The question, or at least I thought was how or even why? Now I doubt that I’m the only person who does this, but in films/television/novels when the plot takes a turn for obscurity, I point fingers and jump to conclusions until the truth gets a spotlight. Wide eyed, I’m practically falling over the edge of my seat when things get suspenseful. Luckily, that was part of the reason that kept me turning the page. As promised, Mara finds a love interest in oh-so-delicious British accented, just rolled out of bed rich boy Noah. This is where the typical cloud hovers over them, raining mildly amusing dialogue. The description Michelle Hodkin managed to weave from her own imagination reached out and pulled me in, or at least that’s what it felt like; I could picture it so clearly as if I were there. It was fabulous. What invoked an eye roll was the eventual cheesy words spoken between Mara and Noah. I don’t know…teenagers talking about being together forever makes me cringe. The realist in me doesn’t get along with the romantic in me. There were a few times that I had to backtrack because I was under the impression that I was reading way too fast and missed something important, but no dice. I assume all will be careful explained in the rest of the upcoming series. That way I won’t have to ask certain characters who the hell they are when they don’t speak back. 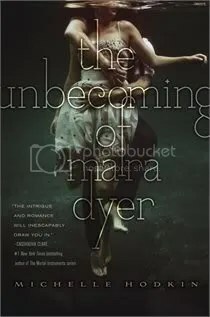 I give The Unbecoming of Mara Dyer a rating of 4 out of 5 stars because of my almost love. It was an interesting read, especially when the suspense is cooled. This book is not your ordinary paranormal adventure. It was refreshing, all out mysterious and passionate. I’m glad I bulldozed everyone in my way at the library to get to it. (I may be kidding). It was a fantastic attempt of the first in its series and I will happily be looking forward to the next installment. I highly recommend it. Keep an eye out for the next in its series- The Evolution of Mara Dyer in fall of 2012. This entry was posted in 2012, Reviews and tagged Book Reviews, Books, Fantasy, literature, Michelle Hodkin, Paranormal, Sasha, Stranger than Usual, Supernatural, The Unbecoming of Mara Dyer, Young Adult by dreamingwithink. Bookmark the permalink.